HARWICH, Mass. 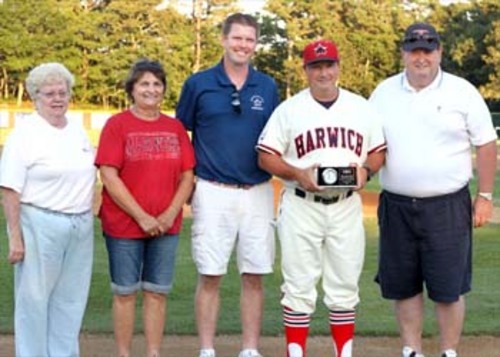 -- Steve Englert, popular field manager of the East Division Champion Harwich Mariners, has been named 2012 Mike Curran Award winner as Manager of the Year in the Cape Cod Baseball League. Englert, completing his 14th season in Harwich, including the last eight at the helm, led the Mariners to a 27-16-1 record and was rewarded by a vote of his fellow managers. The Mariners are defending Cape League champions and Englert would like nothing more than to go back-to-back. He also skippered the Mariners to the CCBL crown in 2008, their first league title since 1987. Englert’s current position the past 11 years assistant coach at his alma mater, Boston College, has also resulted in a high level of success. Twenty-three of his former players have been drafted. Englert’s keen eye for talent and teaching skills have resulted in an award-winning formula. The CCBL manager of the year award is named after Cape League Hall of Famer Mike Curran, former assistant sports editor of the Cape Cod Times and one-time president of the league. Curran first joined the Cape League as a scorer while a student at UMass- Amherst, rising to publicist and eventually league president in 1976-1977. He is largely responsible for creating and expanding a nationwide recruiting system to bring top college players to the Cape instrumental in gaining national recognition for the league. The Cape League has been awarding Curran managerial awards since 1978 when future Kansas City Royals manager Bob Schaefer captured top honors for Hyannis. Current Yarmouth-Dennis skipper Scott Pickler is a 3-time winner in 2008, ’09-’10 and Kelly Nicholson of Orleans has won twice in 2005 and 2008.